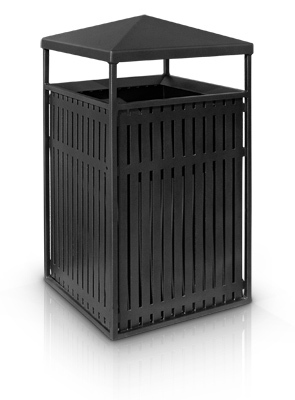 This high quality trash receptacle features a contemporary ribbed steel design in a square shape that complements almost any environment. The receptacle opening is covered by a sleek angled roof to funnel rain, snow or other unwanted materials away from the receptacle. The handcrafted, high quality ribbed metal frame and top are available in the color options shown below. Trash receptacle holds 32 gallons and comes standard with a rigid plastic liner.